Soon I’ll be on my way to this weekend’s Radical Mycology Convergence, an annual gathering of citizen scientists, mushroom enthusiasts, and other earth-loving types. 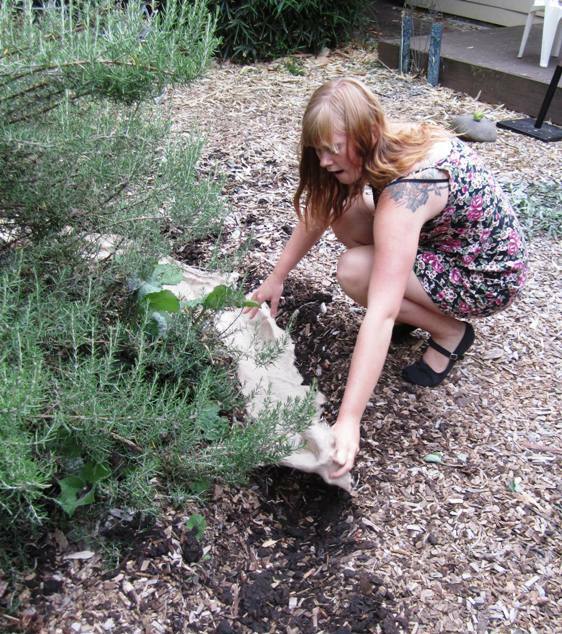 It’s all about learning how to heal the earth by partnering with fungi. Radical Mycology Collective founder Peter McCoy’s guest post explained how mushrooms become our allies, teachers, and partners. 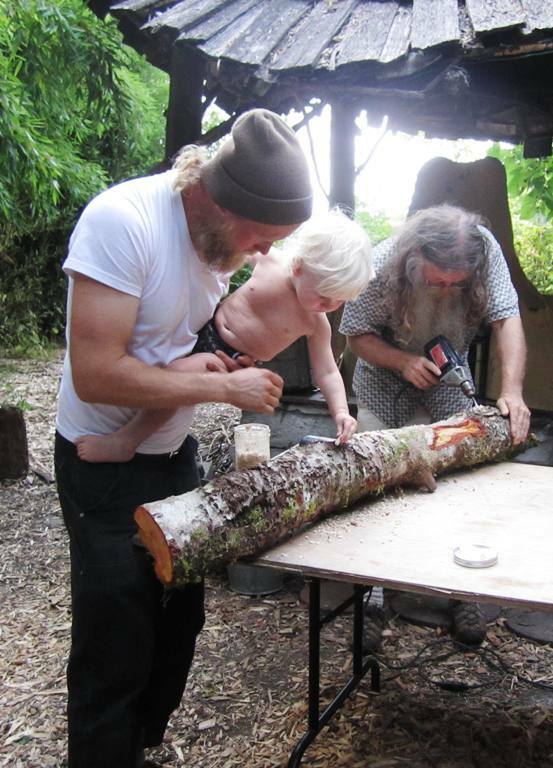 I mentioned before that I had a chance to help Peter and other radical mycologists with an installation of bioluminescent mushroom mycelium this summer in Olympia, WA. Here’s a bit more about that experience to whet your appetite for the convergence. We used both “plug spawn” and “chip spawn” of a mushroom called panellus stipticus. 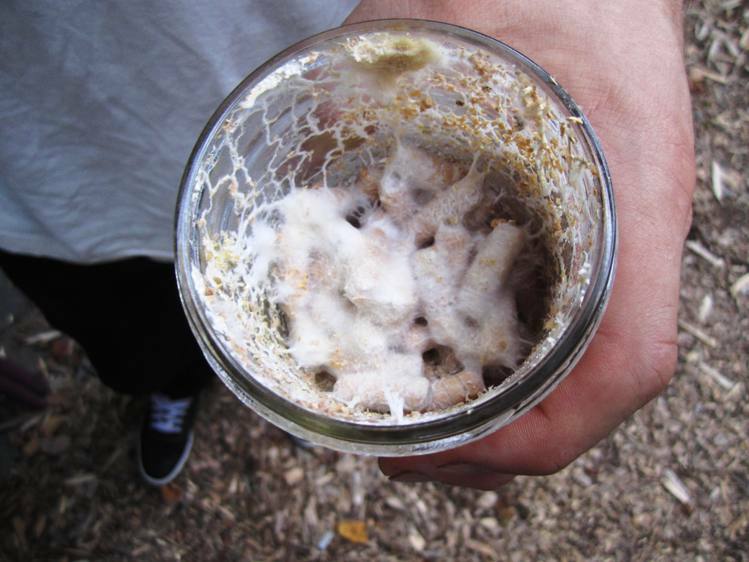 Peter holds a jar of “plug spawn”–bits of furniture dowel that he inoculated with mycelium. Panellus is not known for remediative properties, but for its ability to—seriously—glow in the dark. I saw this bioluminescence for myself when I took a section of inoculated burlap home. Tiny mushrooms had emerged on the outside of the “chip spawn” bag, and they did indeed glow in the dark. One of the coolest things I’ve seen in a long time. 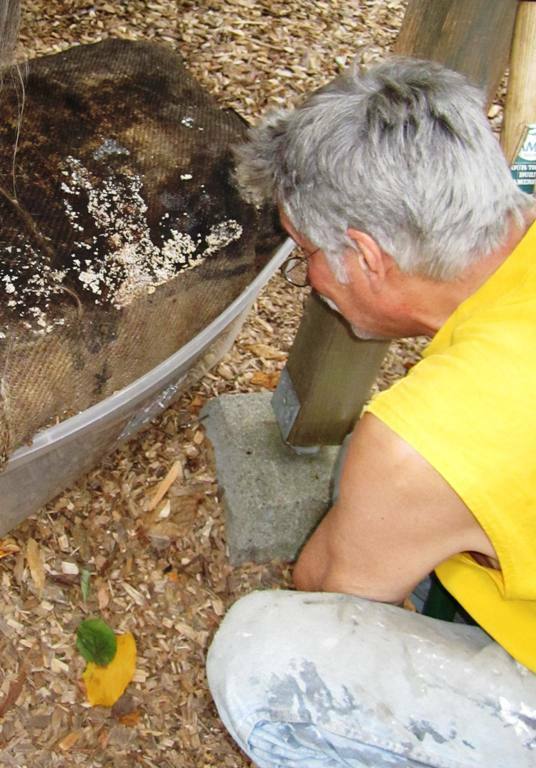 Checking out the “fruiting bodies” (tiny mushrooms) on the outside of the burlap bag full of inoculated wood chips. 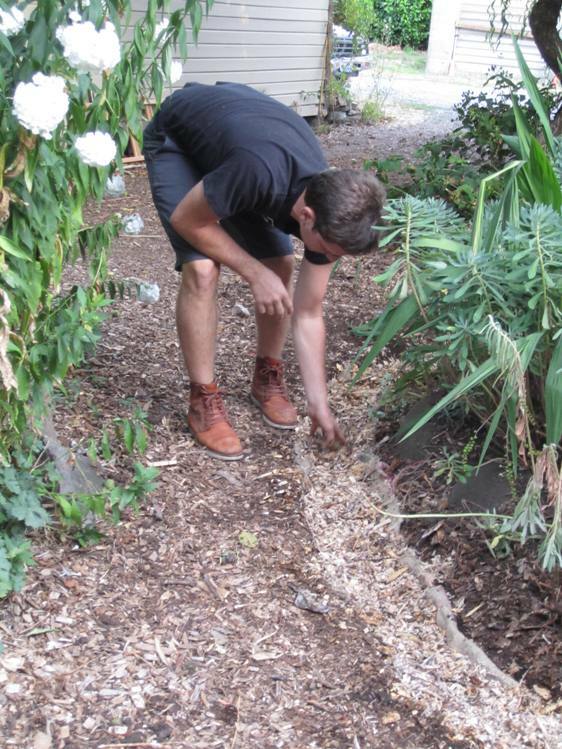 We used inoculated wood chips to make a path around an herb garden. The dowel bits went into a freshly cut red alder log. Eventually the log itself should glow, or it may even pop out with little glowing mushrooms. Peter emphasized that the same techniques could be used in a mycoremediation project, or to grow mushrooms as food or medicine. The leaders will be guiding us through several onsite remediation projects. Other attractions: a Passion Show, culture/spore swap, and “forays.” Wahoo! So to get in the spirit, for the first time ever I tried a mushroom called chicken of the woods. Its beautiful orange folds just called to me from the food co-op bin. I’ve been sauteeing bits of it up with my eggs every day for lunch. I’m finding it a pretty complement to bright orange egg yolks, and it does taste like chicken. So here’s to trying new things. Note: Registration is still open for the Radical Mycology Convergence, happening Oct. 9-13 in Orangeville, IL. 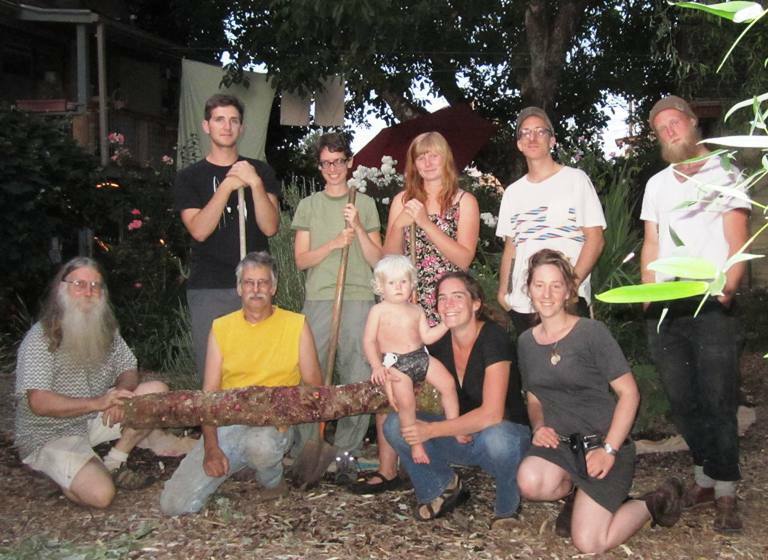 This entry was posted in Community, Inspiration and tagged Activism, consciousness shift, DIWO, Do-it-with-others, Environment, Foraging, Garden, Mushroom, Mycology, Mycoremediation, Permaculture, Placemaking, Radical Mycology, Radical Mycology Convergence, resilience, Small but Mighty, Sustainability. Bookmark the permalink.